This is an oscillating marquee, with the top cover removed to show the inner workings. 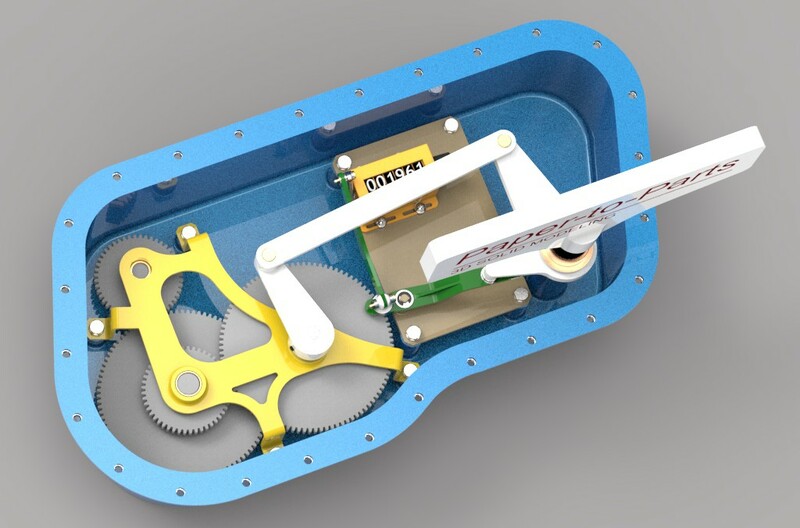 A drive motor is connected (on the back side) to the input gear, and rotates the gear train (4:1 ratio). Every complete revolution of the output gear operates the white mechanism, that results in the marquee oscillating from the neutral position shown, to +45 degrees, reverses back through neutral to -45 degrees, then reverses back again to the neutral position. The green mechanism is designed to pull the lever of the cycle counter from the vertical position shown, down 42 degrees, and back to vertical with every output gear rotation. To see videos of this mechanism in motion, click this link to go to the Motion Simulation page.